There's a cage at the San Diego Wild Animal Park where you can take sugar water to a group of brightly coloured lorikeets. It's a strange place full of screaming kids traumatising themselves as tiny parrots climb over their bodies on sharp little talons, hunting the little plastic pots of nectar. Meanwhile parents wave futile arms, trying to flap away the unflappable. Then there are the photographers, zooming in on each brightly coloured feather, awed by the blues and yellows and reds and green, admiring the detail in the pinpoint black eyes and the curve of the orange beak. The birds pose for them, hoping for a sugary reward. "Who's a pretty boy then?" There's a similar feeding station in the Woodland Park Zoo in Seattle, although it's clumps of seeds on the end of popsicle sticks, and small parrots from Australia. Lots of fun! Very Pretty. Great texture captured! Thanks for sharing. 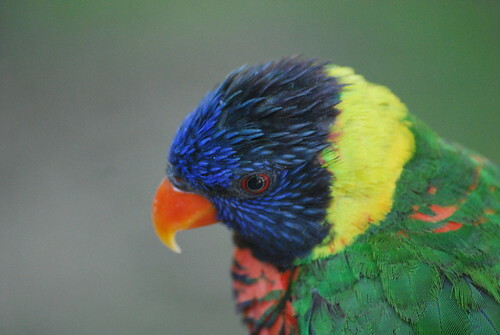 At the Aquarium of the Pacific in Long Beach, they have a similar lorikeet nook. It's fun until they dive bomb your head and defecate on you. Cute pic though.